Are you really buying the true American Red Snapper fish? The Red snapper name has been used on more fish, red in color than any other fish in the seafood industry. West Coast Rockfish are sometimes called "snapper". But there is only one true American red snapper fish with it's red skin and red eyes. The common market size of red snappers are 4 to 6 pounds, although some can be as large as 35 pounds. Smaller snapper will have a metallic pink skin to them, but as they grow larger the skin becomes much redder. There are many other species of snappers which all are very tasty. 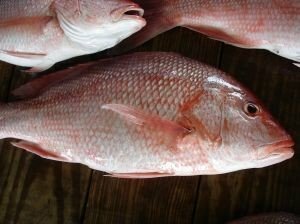 Red snappers are found in the waters from North Carolina to Florida and coastal waters of Louisiana and Texas. Imported snapper comes from Mexico. A raw red snapper fillet will be pinkish in color with some yellow tones in the meat. The cooked meat is sweet, lean and moist. A true American red snapper fillet will not curl when cooking. Red snapper can be cooked many different ways from grilling to baking the whole fish itself. The skin adds color to your plate presentation.